← How to add a smile-face comment to pdf files with VeryPDF PDF Editor? How to convert mhtml to thumbnail? When you browse many files or many images in a folder,they are always showed as list form by default.But if you want to upload some pictures about your recent life,you may not separate which are the right one.So the thumbnails can do you a great favor.You can click the icon on the toolbar of the folder,then you will see five options in the list:thumbnails,tiles,icons,list and details.Please click “thumbnails” to see the smaller size files of the original images. The thumbnail is designed to saving loading time,disk space,page,maybe ink because thumbnails are reduced-size versions of pictures.Thumbnails are used in modern operating systems or desktop environments, such as Microsoft Windows, Mac OS X, KDE, and GNOME. Not many people are familiar with mhtml format file,so converting mhtml to thumbnail is a good idea.HTML Converter command line can be used to create nice-looking thumbnails that can be used on HTML web pages quickly and effortlessly. It can automatically create high-quality thumbnails, decrease images and convert them to JPEG, GIF, PNG, etc. web compatible formats. You can load HTML Converter command line at http://www.verypdf.com/htmltools/htmltools.zip. 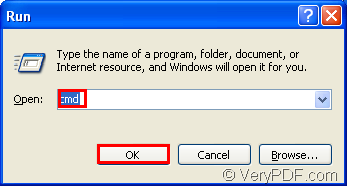 You can also know more about HTML Converter command line by visiting http://www.verypdf.com/htmltools/index.html and http://www.verypdf.com/htmltools/htmltools-manual.htm. HTML Converter command line is a zip file when you load it and it can be used after being unzipped.HTML Converter command line should be registered by the register code,or the functions will be limited. Now you can follow the steps below to convert mhtml to thumbnail,for example a jpg format thumbnail. 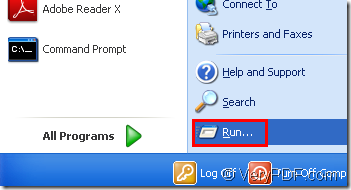 1.Run cmd.exe by clicking start menu and click “run” in the menu,then input “cmd” in “open” edit box and click “OK” button.Please Figure1 and Figure2. 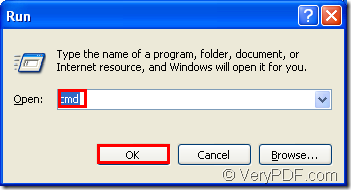 Pressing “Windows”+ “R” on your keyboard at the same time can also open the dialog box showed in Figure2. 2.Input command lines.The command line to convert mhtml to thumbnail should contain the called program,requirement(such as the resolution and size of thumbnail),source file and target file.Please see Figure3. Here are interpretation to the commands. "C:\Documents and Settings\admin\Local Settings\Temp\htmltools\htmltools.exe" is the directory of called program which is htmltools.exe. -xres 500 -yres 700 are resolution settings. -xres 500 means the resolution value of X orientation is 500 DPI and -yres 700 means resolution value in Y orientation is 700 DPI. -width 300 -height 500 are size settings.The width of thumbnail is 300 pixel and height is 500 pixel. 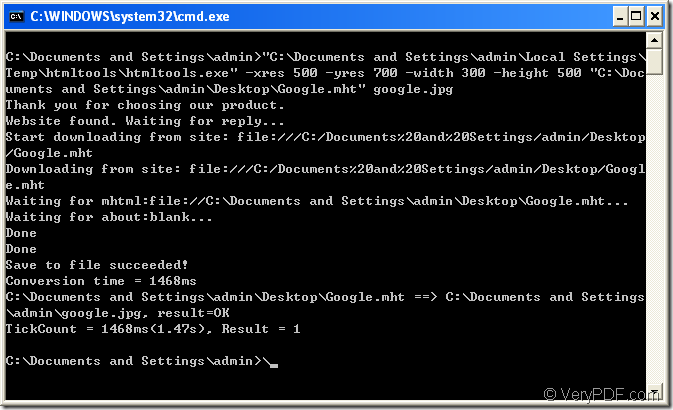 "C:\Documents and Settings\admin\Desktop\Google.mht" is the path of source mhtml format file. 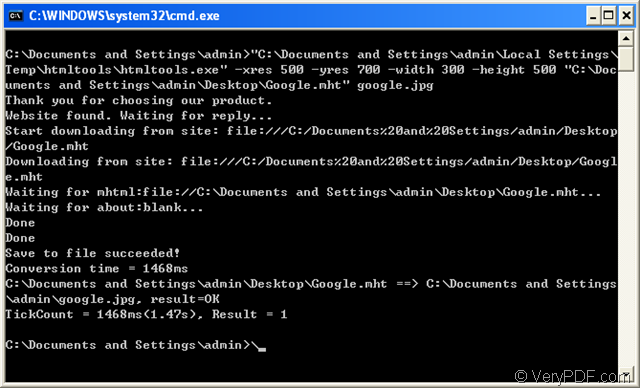 google.jpg is the name of target file,including file name and extension name. 3.Then the thumbnail will be found in current directory.Please see Figure4. When I click on “docPrint Software” a screen briefly flashes and then disappears.